Summer is ending, but it’s still hot enough here to wear light Summer clothes and footwear, and it seems like it’s going to be like this well into October. 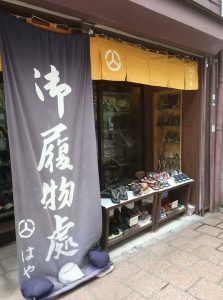 What about getting yourself a nice pair of fine traditional Japanese shoes, the likes of “zori” (traditional Japanese sandals) or “geta” (traditional japanese wooden clogs)? If you’re looking for one of these and you want them to be really Japanese in style and crafting, here very close to us at WeBase HAKATA, you’ll find just the perfect spot for you shopping: right next to the Hakata-Za Theatre, a quick 3 minute walk from WeBase HAKATA, you’ll find the loveliest zori & geta shop in town — this is Hakimonodokoro Hayama, a shop fully specialized on traditional Japanese footwear for over a century! All articles are genuinely made in Japan and, for the most part, they are sold for very reasonable prices. 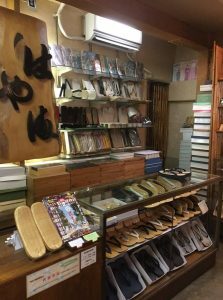 If you’re coming by and you’ve been thinking of getting yourself a fine comfy pair of ‘zori’, come take a look at this beautiful shop, Hayama, an absolute must of Old Hakata! Come visit us. Come stay at WeBase Hakata! HAKIMONODOKORO HAYAMA Shop 1-332 Shimokawabata-Machi Hakata-ku Fukuoka, a short 3 minute walk from WeBase HAKATA, across Meiji-Dori Av.